Winter season may not be a good time for some golfers to play golf in Branson but there are some who want to experience the fun as they find it more challenging. Golf is a nice game to enjoy at the best of times, but playing golf in Branson during the cold season is something that you should need some planning and preparation. 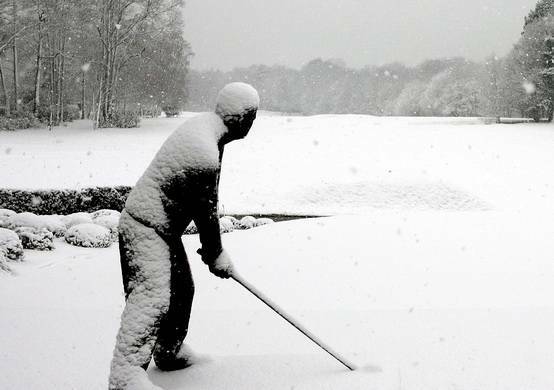 If you are one of those golfers who want to keep on playing – even with winter greens, snow and cold conditions – then you need to learn some tips that can help you survive on winter golf. Before planning to play golf in Branson, check the club that you have, your ball will not go as far in the cold. You might have to hit 1 to 2 clubs more (so use a 5 iron instead of a 7 iron) on every shot, and you’ll be sure to get to the hole. As the ball usually doesn’t go as far, consider playing one tee up from your normal length. When playing golf in Branson, you are advised to wear proper clothing. Considering wearing multiple layers, thermal t-shirt, thermal underwear, a sweeter and a light-weight windbreaker. It is also a must to wear a good winter hat (this can help minimize the lose of body heat through our head). Remember not to wear too much, because it can affect your swing. Keep walking around the golf course. Avoid using buggy or cart. By choosing not to walk, you’ll be surprised how much walking will warm up your body. You can also stay looser and your swing won’t suffer that much. Remember that cold golf balls don’t fly as far as warm balls, so you need to have two balls. Keep the other ball in your bag to make it warm as possible. Use each ball on alternate holes. As long as you do not heat the balls artificially during the round you are within the rules. Use softer balls as they are easier to compress in cold weather. Avoid using a hard rock ball like a Top Flite XL which feel like a steel ball on a cold day, so go for a softer option. It’s also a good idea to invest in some proper winter gloves as this can help warm your hands. Use gloves that are suited for golf. When your hands are warm, you can make a good grip on your ball. When you play golf, always stay hydrated. Avoid drinking coffee and hot chocolate even if it’s cold. Drink instead water and energy drinks as these can provide good nutrients and hydration to your body especially when it’s cold. Hot coffee just can’t make your golf playing better. You drink hot chocolate, but don’t forget to drink water or energy drink every hole to stay properly hydrated. So, if you really want to experience the fun of playing golf in Branson during winter time, learn some golfing tips so you can enjoy your game.